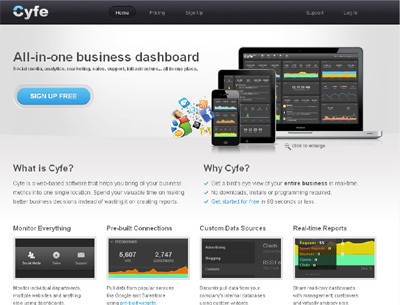 Cyfe is a web-based software that helps businesses bring all your vital metrics into one single location in real-time. It’s an all-in-one dashboard that automatically pulls in vital business data from external services like Facebook, Twitter, SEOmoz, Google Analytics and more. Businesses spend up to 80% of their time collecting data and creating reports. Cyfe has developed a cloud based service that solves this problem by allowing them to easily monitor and share all of their vital business data from one single location in real-time.